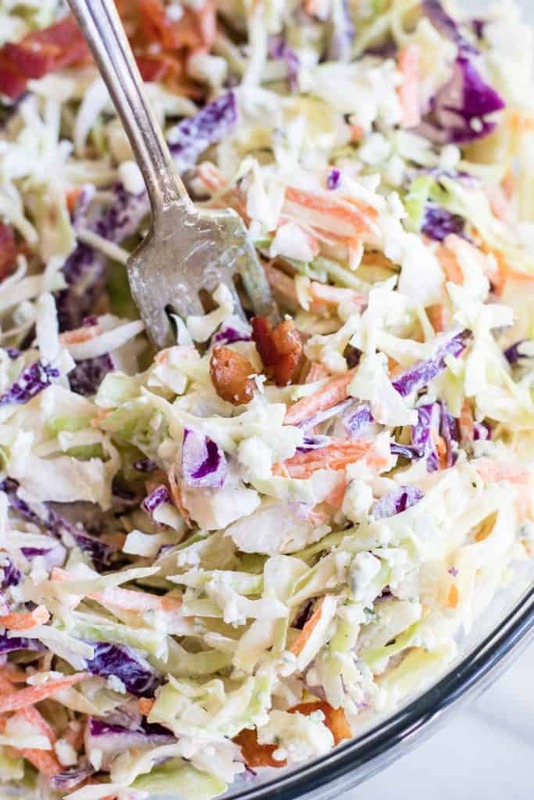 This creamy and cheesy coleslaw loaded with bacon is the perfect side dish for any meal! 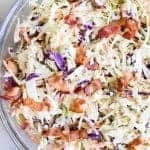 How Do I Make Blue Cheese Coleslaw? This blue cheese coleslaw is made like a regular coleslaw. Chopped cabbage and carrots, mixed with a sweet, tangy dressing loaded with blue cheese crumbles. My favorite part? The bacon pieces that get mixed in. If you’re in a rush though or have no bacon on hand it can absolutely be left out. We make this coleslaw often and only rarely go through the effort of cooking the bacon to add it in. How Do I Make A Coleslaw Dressing? This coleslaw dressing is made with a base of mayonnaise and sour cream. Mixed with a bit of sugar for sweetness and apple cider vinegar for a tangy bite. Mixed all together this make a creamy dressing that coats the coleslaw mix perfectly. To make this a blue cheese coleslaw we just need to add the blue cheese crumbles. I like to mix some of the crumbles into the dressing and then sprinkle a bit on top as well. 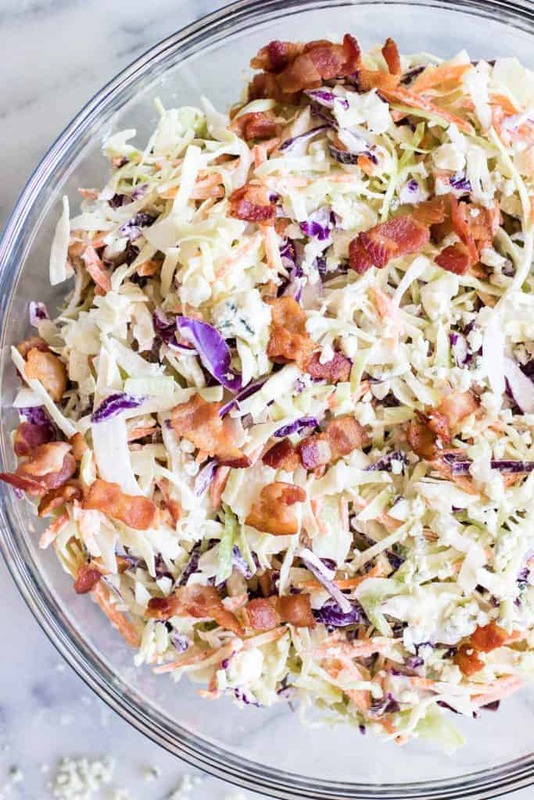 This creamy and cheesy coleslaw with bacon is the perfect side dish for any meal! Add the mayonnaise, sour cream, apple cider vinegar, and sugar into a medium sized bowl. Stir to combine. 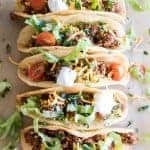 Fold in the blue cheese crumbles. Add in the cabbage and carrots mixture. Stir until completely coated. Top with the crumbled bacon and additional blue cheese as desired. 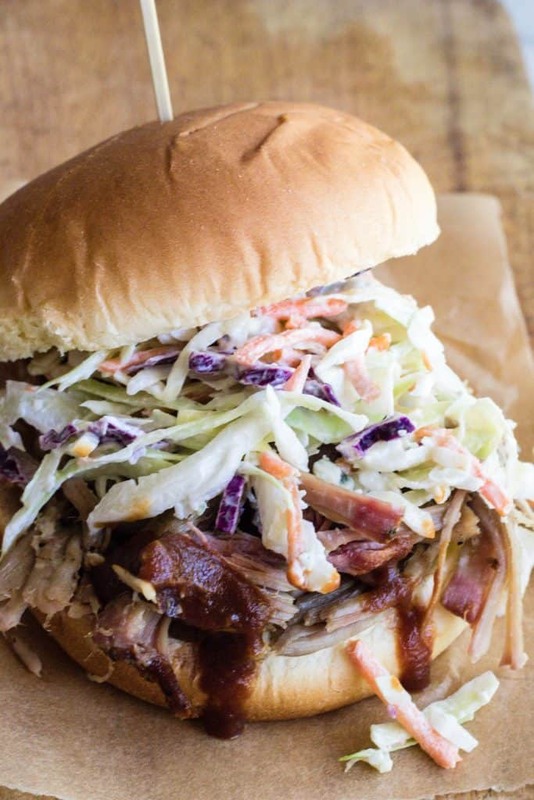 Or stir the bacon into the coleslaw to enjoy in every bite! Very nice and so delicious !!!!!!!! Yay! So glad I found some Texas recipes! I must say we have the best food ever!!! Always so happy to meet a fellow Texan!! And I absolutely agree, best food ever! 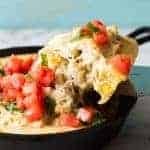 There’s plenty of Texan inspired recipes on the site, hope you have fun clicking around 🙂 thanks for commenting! omg, This was almost out of this world delicious.! Thank you. I hope you won’t mind that I just thought I should ad a little more that a “bit” of the vinegar, also added one large green onion chopped very small, and, just because I also gorgonzola, split the amount of blue and gorg, Did add the bacon. Could not stop eating it yesterday cause it was even better the next day, however very rich. 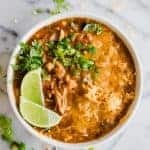 Once again, thank you for the recipe, it will be a favorite from now on,. I’m so glad you enjoyed! This is always a hit in our home. One of my husbands absolute favorites! Your additions sound so good! I’ll have to try adding some gorgonzola next time. Best coleslaw dressing ever! Have already made this once before and it went quickly, like no left overs. Am making again this weekend but for a barbecue and wondered if mixing the coleslaw with dressing ahead of time is okay, that it won’t be soggy? Last time I made it, we ate it straight away and it was delightfully crisp the way I like coleslaw. If you could let me know! I’m so glad that you liked it Lina! The coleslaw does keep, but it does get a little soggy as you stated. It depends on your preference for coleslaw. I’m like you I like it best the first day. My husband prefers it the second day.